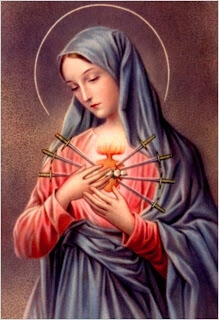 September 15 - Our Lady of Sorrows - Memorial - My Catholic Life! Every life climbs its Calvary. Every soul has its quiet sorrow which cannot be shared in full with any other soul. This concealed pain is the very real drama that plays out behind the curtain of the duties and distractions of everyday life. Jesus Christ, fully God and fully man, shared in all things human, save sin, including pain and sorrow. So He wept at the death of Lazarus, and He balanced the heavy cross on his sore bones and trudged up a hill to his own execution. Thoughts and ideas can be shared in their totality. Emotions and experiences only partially so. Suffering is intensely private in that it is a personal, lived experience. The intense sufferings of Jesus Christ were intensified by His perfection. It was more unjust, more cruel, that one so perfect should suffer at the hands of creatures of His own making. Only a perfect being similar to Jesus could enter into His sorrow, could experience it somewhat as He did. That person was Mary. She was not a Goddess, of course, but the New Eve, the perfect person God intended that every person should be from the start. Because she was perfect, she most understood, and felt, the pain of her perfect Son. Shared perfection led to shared sorrow. Today’s feast commemorates the sorrows of Mary, most especially those lived during Jesus’ passion and death. Devotional images of Mary show her heart pierced by seven swords, symbolic of seven sorrows: the prophecy of Simeon; the flight into Egypt; Jesus being lost in the temple; meeting Jesus on His way to Calvary; standing at the foot of the Cross; being present when Jesus was removed from the Cross; and her presence at His burial. Mary was perfect, but her life wasn’t perfect. She was squeezed by the same wine press of pain, humiliation, and sorrow that squeezes every life. She was unmarried and pregnant and must have heard the neighbors’ whispers as she walked the dusty streets of her town. She and her family had to flee to a far-off land to escape the murderous King Herod the Great. She lived a real life stuffed with real human drama. But her most intense sorrows were felt when she was in her late forties, when her one and only child died a public death, leaving her, already a widow, totally alone, her middle-aged face stretched with sorrow. When our fingers and thumb walk up and down the chain of mercy we ruminate over things glorious, joyful, luminous and sorrowful. We recall historical events like Christ’s Baptism and the Last Supper, and theological events like the Assumption and the Coronation. The Sorrowful Mysteries are historical. Mary hovers just off center stage. She stands nearby, amidst the crowd on the path to Calvary, upright and brave at the foot of the Cross, weeping as her dead boy is wrapped in a sheet and delicately placed on a cold slab in a rocky tomb. She is Our Lady of Sorrows because she, and the Church, are mothers. They give and nurture life. They feel more than men. They respond to suffering with co-suffering, not so much through actions and solutions. On today’s feast, we recall Mary’s sorrow and share in it. But our sorrow is not that of a godless Viking, a pagan Roman, or a modern secularist. Christian grief is not godless grief. Our grief, like Mary’s grief, is ameliorated by the sure and certain hope that the last word in our book is not death and despair but hope and life. Mary’s sorrow is temporary, as all our sorrows one day will be. There is nothing that does not have a context, except for God. And the context for Christian sorrow is the Resurrection. Mary of Sorrows, you shared the pain and sorrow of your perfect Son but were never forlorn. Help all who turn to you to unite our sorrows to yours and His so that we may co-suffer in His death and co-share in His Resurrection. Devotion to the Sorrows of our Blessed Lady dates from Calvary. The Apostolic Church clung round her whom Jesus had given to be its Mother, and ever remembered that it was amid the pains, the Blood, and the agonies of the Passion, that it had become the child of Mary – literally “the child of her Sorrows.” The chief characteristic, then, of the Church’s first love to our Lady was a deep, tender, loving, and child-like devotion to her Sorrows, and the Apostolic age bequeathed this exquisite feeling to succeeding times. From the sorrows of the most holy Mother of God, learn that all sorrow is the effect of sin. The first tears that ever dropped from the eyes of man were wrung from him by the bitter loss which he sustained on account of sin; and every tear that has since fallen, and gone to swell the tide of human woe, has had its origin in sin. Mary had never been guilty of sin. But sin seized upon and murdered her only Child; and therefore sin made her weep, we might almost say, tears of blood, upon the place dyed with the blood which she had given to Jesus Christ. Look back at your life, and call to mind the numberless times in which you have sinned against your Lord. Each of these sins had its share in causing Mary’s bitter tears. They helped to strike down that thorny wreath upon the brow of Jesus; to wield the cruel scourge; to dig through the delicate hands and feet; to murder Him upon the Cross. They gave nerve to the executioner’s arm, and malice to the hypocritical Scribe, and words of scorn to the rabble that screamed and yelled around the Cross. Ever glorious Blessed Virgin Mary, queen of martyrs, mother of mercy, hope, and comfort of dejected and desolate souls, through the sorrows that pierced thy tender heart I beseech thee take pity on my poverty and necessities, have compassion on my anxieties and miseries. I ask it through the mercy of thy divine Son; I ask it through His immaculate life, bitter passion, and ignominious death on the cross. As I am persuaded that He honors thee as His beloved Mother, to whom He refuses nothing, let me experience the efficacy of thy powerful intercession, according to the tenderness of thy maternal affection, now and at the hour of my death. Amen. Hail Mary, etc. Of the sole begotten One! Make my heart with yours accord. Is all I ask of you to give. Let me share your grief divine. Of that dying Son of yours. O Blessed Virgin Mary, Immaculate Mother of God, who didst endure a martyrdom of love and grief, beholding the sufferings and sorrows of Jesus! Thou didst co-operate in the benefit of my redemption by thy innumerable afflictions and by offering to the Eternal Father His only-begotten Son as a holocaust and victim of propitiation for my sins. I thank thee for the unspeakable love which led thee to deprive thyself of the Fruit of thy womb, Jesus, true God and true Man, to save me, a sinner. Oh! make use of the unfailing intercession of thy sorrows with the Father and the Son, that I may steadfastly amend my life and never again crucify my loving Redeemer by new sins; arid that, persevering till death in His grace, I may obtain eternal life through the merits of His Cross and Passion. Mother of love, of sorrow, and of mercy, pray for us.